Call (206)-654-4990 To Schedule Your Heat Pump Or AC Repair And Maintenance Today! At Fox Plumbing & Heating we provide the very best Seattle Heat Pump or AC repair and maintenance services. No matter what the issue is, we can find an effective solution. We know that your heat pump or air conditioner was a major investment in creating energy efficient home comfort. This equipment does require professional maintenance to ensure they run optimally at all times and deliver the heating, cooling and savings you expect. By keeping it well maintained and repaired, you can extend the life of your equipment significantly. An untrained person should never attempt these services as it can cause significant damage to your unit. WHAT ARE SOME SIGNS YOU NEED HEAT PUMP OR AC REPAIRS? If your heat pump or air conditioner stops working, call for emergency service right away. Or, if your equipment exhibits any of these signs, it may be a warning of impending damage, and a service appointment would be the next step. Note, if you find that part of your house is cool and part doesn’t get cool enough in the summer (usually upstairs), this can be a) a thermostat issue, b) not enough ductwork or cold air returns in the house, c) a sizing issue of the equipment, or d) an actual equipment issue. WHAT DO MAINTENANCE SERVICES INCLUDE? It’s time for your air conditioner or heat pump to get its annual check-up. Your service technician is going to go through a battery of tests and procedures when they are servicing your unit. The outdoor unit will be opened and disassembled to make sure that no interior parts are broken. This means that the service technician is testing every part of the unit. This part of the service can prevent major problems from cropping up unexpectedly. Also, the service professional will check the state of your refrigerant, and ensure that your fan is working properly. When the service is over, the technician will run the unit to make sure everything is in working order. The service for a heat pump will include testing of both the heating and cooling functions. Looking to extend the life of your air conditioner? Whether you have central air conditioning, a heat pump system or a ductless split system, Fox’s Air Conditioning Specialists are have the knowledge and skills to provide maintenance and repair services. We will arrive in a timely fashion and guarantee to get the job done right. 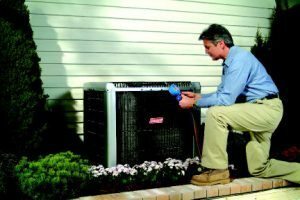 Additionally, you can schedule out the maintenance appointments for your air conditioner to ensure that it is always taken care of even when you forget. Call Fox Plumbing & Heating to schedule your annual Heat Pump or A/C check-up, and prevent costly breakdowns. Also, ask your Specialist about our FOX AAA Preferred Service Agreement to help ensure that regular service is performed on your equipment. Call us at (206)-654-4990 or click to schedule an appointment for our industry leading Seattle air conditioner repair and maintenance services today!